Roses are very beautiful flowers but they are also very beneficial due to which rosewater is commonly used in many beauty products. 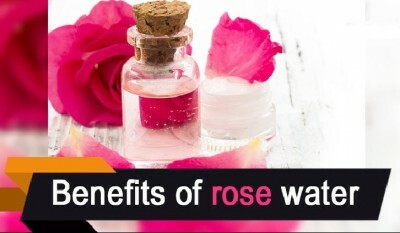 Here below, we are providing you few beauty benefits of rose water. Rose water moisturizes, hydrates and refreshes the skin which is important for maintaining healthy skin. You can get a sparkling and healthy skin by regular use of rosewater. Rosewater also contains several antioxidant properties which makes stronger skin cells and prevents wrinkles. It makes the skin to regenerate. The moisturizing and nourishing properties of rose water are quite beneficial for your scalp also. Rose water reduces dandruff and slight inflammation and makes your hair healthy. Dark circles and puffy eyes were treated by rose water before the emergence of medicated eye drops. The regenerating properties of rose water cures skin problems and your eyes look beautiful. Rose water can also be used as a cleanser. Clean your face by pouring few drops of rose water on a cotton ball and use it on your face. You will instantly get a fresh look as it removes dead skin and dirt. During summer season, rose water helps to treat rashes and sunburns. You can easily do so by spraying it on the affected area. Acne can also be treated by rose water. For this purpose, blend equal quantities of rose water and lemon juice and then apply it on the affected skin. Leave it for an hour and then rinse it with water. Apart from acne, you can also remove scars and blemishes from your skin by using this technique. You can replace your regular moisturizer with rose water by pouring it in your regular cream. It usage will make you know the effectiveness of rose water for skin.